The International Award for Young People Nigeria held a Training for Trainers workshop which took place from Monday the 24th to Thursday, the 27th of October 2016 at the National Award Office, Lagos. The Training workshop was led by Mr. Martin Matabishi, Africa Regional Manager and Miss Joanne Waweru, Africa Regional Assistant. It was attended by Award Leaders from various Award units, volunteers and the NAO staff. The aim of this workshop was to produce a pool of more highly skilled and confident trainers to act as trainers in their own institution as well as form part of the support for the country and National Training Panel. The Training sessions focused on topics like introduction to adult learning, Personality – colour energies, introduction to ADDIE (Analysis, Design, Development, Implementation and Evaluation), self-assessing against NAOME (Needs, Aim, Objectives, Methods and Evaluation), development of training materials, delivery styles and skills and group dynamics. Loads of activities were carried out in groups to emphasize the importance of team work and group dynamics, there were also opportunities for Award Leaders to design and deliver presentations on the topics assigned to them. 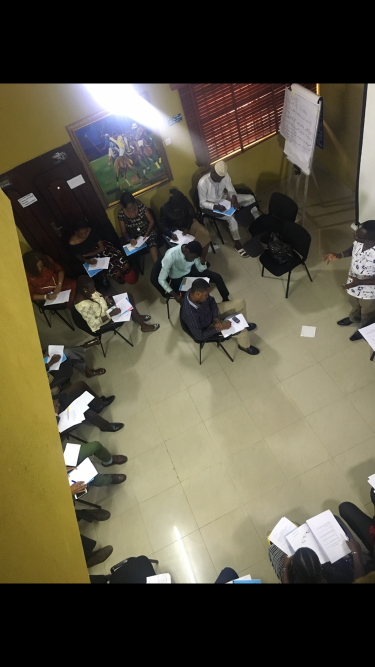 In the words of one of the Award leaders, “The Training workshop was a well-orchestrated program with facilitators whose delivery styles were engaging and brainstorming. I learnt the essentiality of understanding one’s self before understanding others, as every advancement and achievement of mankind is connected to self- awareness. As a trainer, I must know my audience and be sensitive to the learners. In summary, the training has provided me with profound insights in designing and delivering training sessions for variety of needs and audiences. For me, it was a unique experience and I found it remarkably rewarding”.